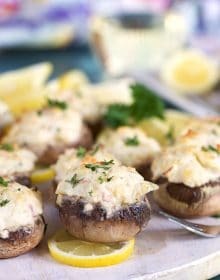 The BEST EVER party appetizer, this Crab Stuffed Mushroom recipe is easy to whip up quickly for any occasion. 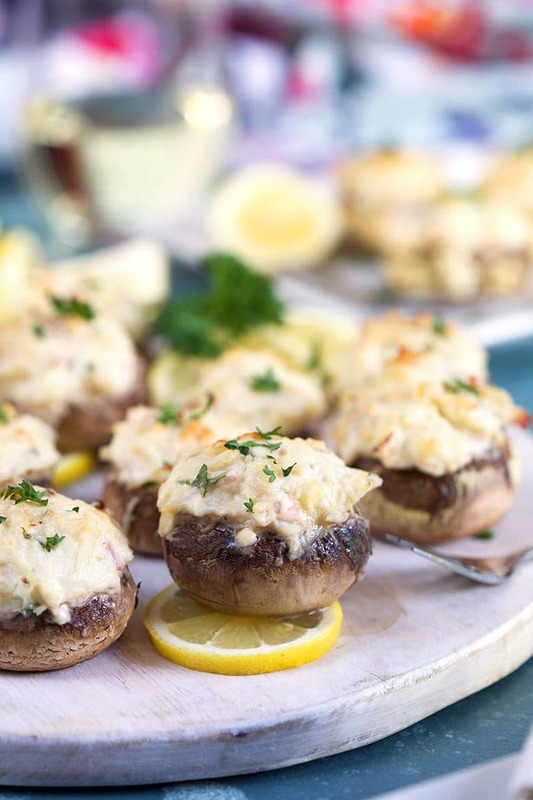 Cheesy Crab Dip is stuffed inside mushroom caps and baked to melty, gooey perfection. Betcha can’t eat just one. Party season is starting to ramp up…and you know what I’m looking forward to the most? The appetizers. Tiny bites of perfection allow you to try so many different things without seeming like a gluttonous beast hanging out at the punch bowl with a pile of food in your hand. 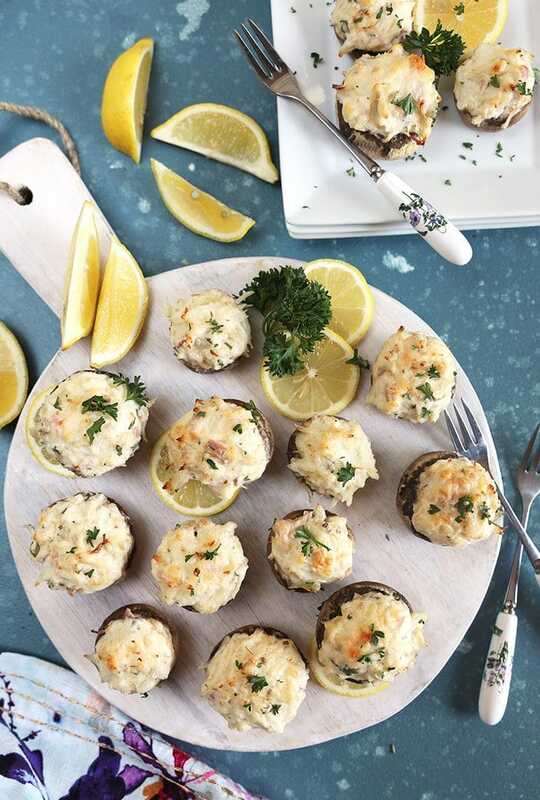 But then there’s always that one thing that I love the most and I end up hovering around that platter like an animal stuffing my face like it’s my last meal…..that’s what happens when these Crab Stuffed Mushrooms are around. I, seriously, can’t stop eating them once they’re out of the oven. It was even difficult to keep my hands off of them when I was taking these photos! Inspired by my, now famous, crab dip recipe, these little morsels of heaven are filled to the brim with a similar crab cream cheese mixture that bakes to a bubbling, meltingly beautiful bite. They go so well with those epic cheese boards everyone is making these days and are fantastic for a casual cocktail party. I like to add these cheese stuffed mushrooms to our Christmas Eve Brunch because I can totally prep them in advance and if you have extra crab stuffing leftover, it’s fantastic as a cold crab dip with crackers or crostini! 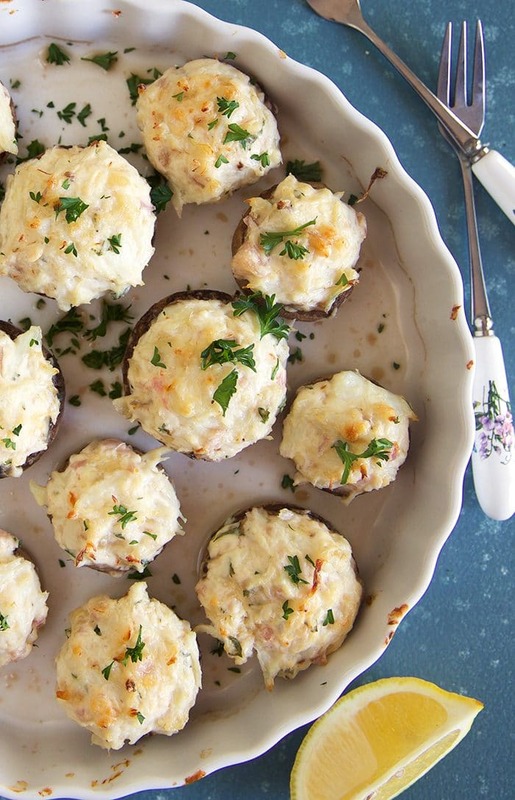 How do you make stuffed mushrooms with crabmeat and cream cheese? 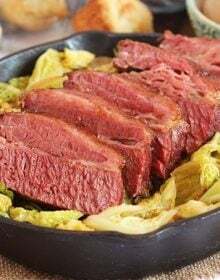 In a bowl, beat together the cream cheese, mayonnaise, sour cream, lemon juice, worcestershire sauce, cheese, parsley, salt and pepper until combined. Fold in the crabmeat and set aside. Remove the stem from the mushrooms and scoop out the brown gills. Fill the mushrooms with the crab mixture. 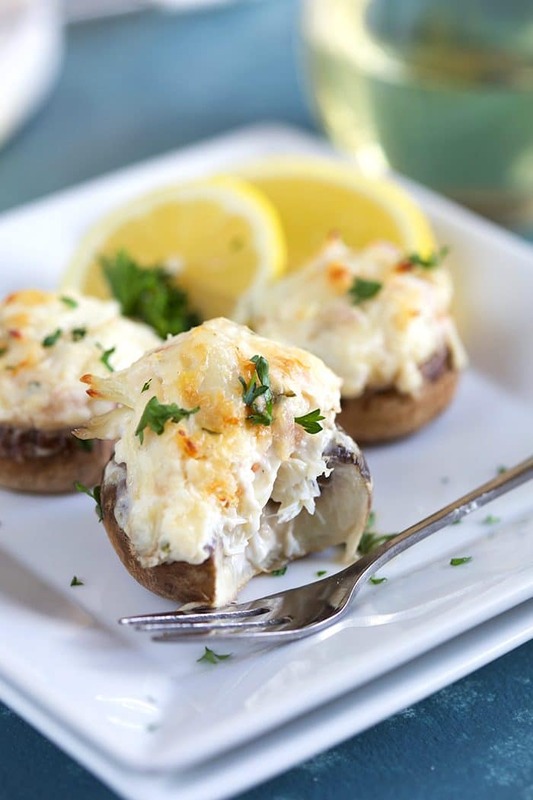 Bake the crab stuffed mushrooms in the oven for 25 minutes or until bubbling and beginning to brown. Remove from the oven and sprinkle with parsley, if desired. Serve immediately. How long do you cook stuffed mushrooms with crab? Once you have your mushrooms filled with the crab stuffing, baking them doesn’t take long at all. Generally, the baking time is approximately 25 minutes but it will depend on how large your mushrooms are. Larger mushrooms will take a bit longer to bake. What ingredients are in the crab stuffing? Can you make crab stuffed mushrooms ahead of time? 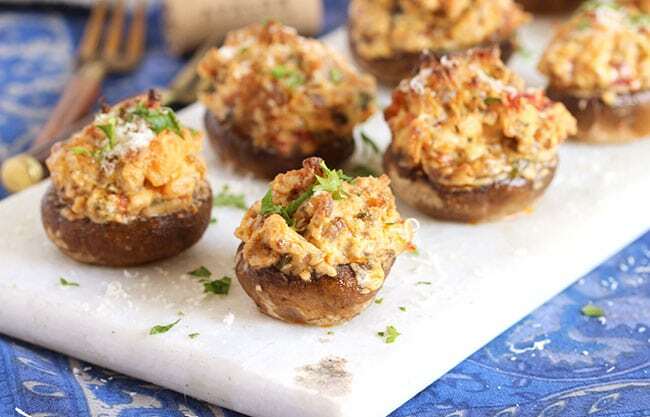 One of my favorite things about these easy Crab Stuffed Mushrooms is that they can be prepped in advance and stored in the refrigerator until you’re ready to party. Simply follow all the assembly instructions, arrange in a baking dish and cover tightly with plastic wrap. Store in the refrigerator for up to 24 hours. Unwrap the stuffed mushrooms and bake in the oven as directed right before serving. 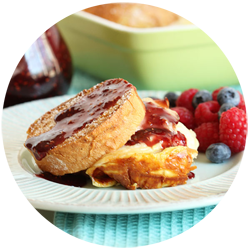 Try out a few of your own ideas, too….the options are limitless! This easy stuffed mushroom recipe is great for those on a healthy diet because they are totally gluten free! And they may even be Keto approved but I don’t know all the ins and outs of that so check out the nutrition facts for more on that. Sausage Stuffed Mushrooms are the original gangster here as far as apps go. 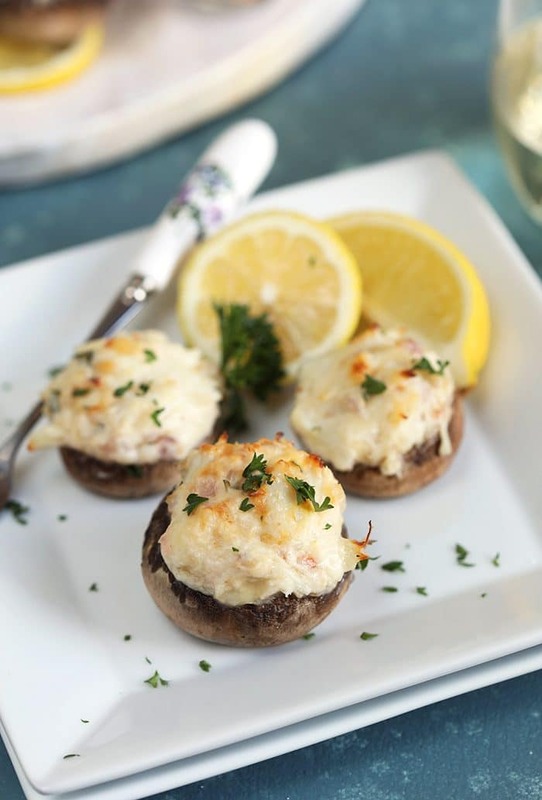 This Crab Dip recipe is the inspiration for this Crab Stuffed Mushroom recipe to begin with. Buffalo Chicken Dip….that would be totally amazing in a mushroom…Just sayin’. Try the BEST EVER Clams Casino…so easy. These mini Crab Cakes are super amazing, too! 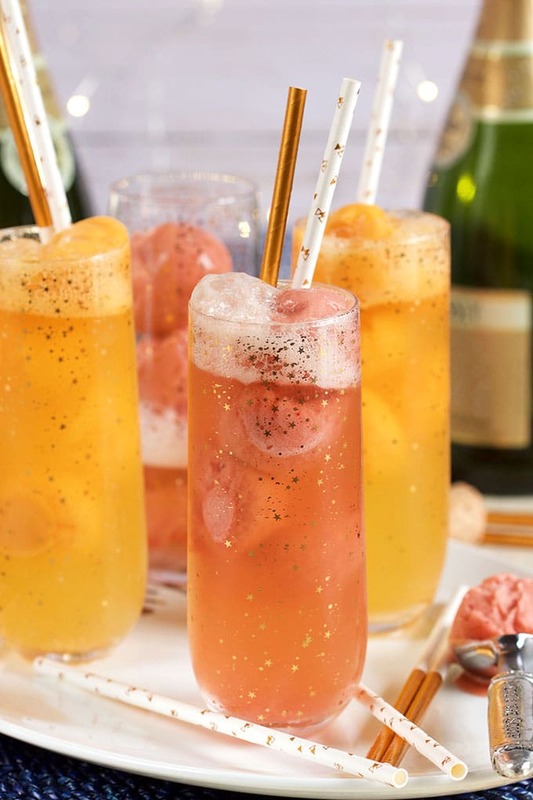 Easy Mimosa Floats….like a grown up root beer float. Spiced Blood Orange Dark and Stormy…my new favorite drink ever. Summer cocktail? Lemonade Gin Mojito coming right up. Or maybe you just need a classic…this Margarita is perfect and authentic. 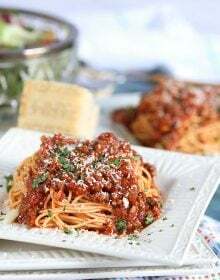 Looking for more easy recipes for your next blow out? Follow us over on Instagram for fun food and behind the scenes craziness….like my super messy kitchen that looks like a hurricane hit it. 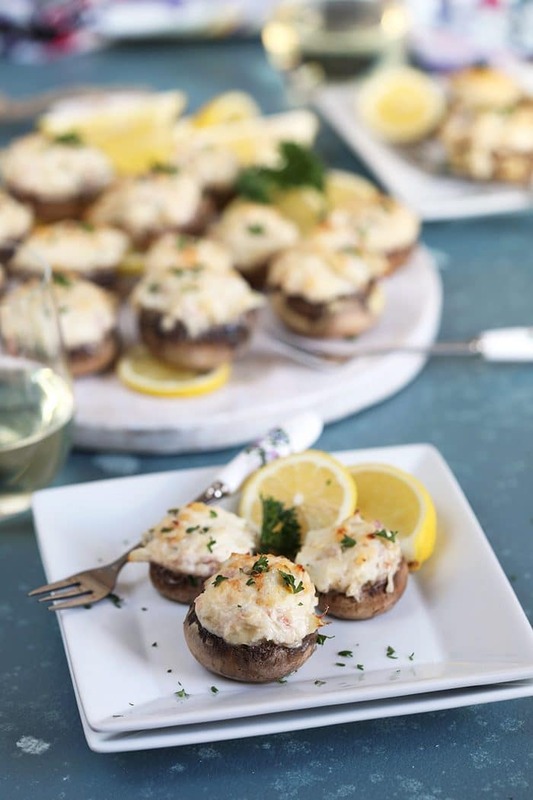 Super easy to make Crab Stuffed Mushrooms are a fantastic addition to every single party. 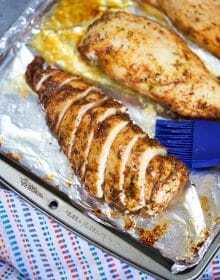 A great make ahead recipe for stress free entertaining. 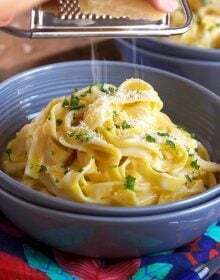 Place the cream cheese, parmesan, sour cream, mayonnaise, worcestershire sauce, lemon juice and parsley in a bowl. 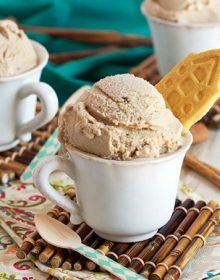 Beat the ingredients with a hand mixer on medium speed until smooth. Add the crab meat to the bowl and fold together using a rubber spatula. Fill the mushroom caps with the crab mixture and arrange in a baking dish. 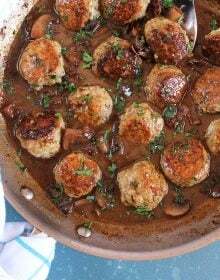 Bake the mushrooms for 20-25 minutes or until just beginning to turn golden brown. Mushrooms can be assembled up to 24 hours in advance and stored in the refrigerator in an airtight container. Bake the mushrooms right before serving. Mine too! So perfect for parties! 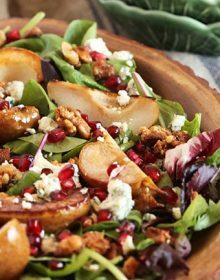 Everything about this is good – two of my favorite ingredients in 1 recipe!! 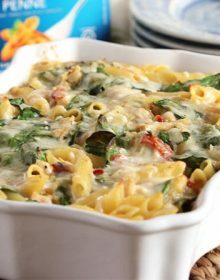 These are super hearty & perfect! 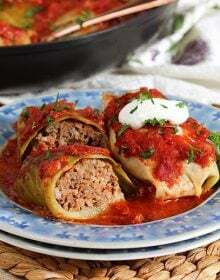 They’ll be a perfect appetizer for Christmas! Thank you! We serve them every year. Could you mince or chop the mushroom stems and add to the stuffing mix? These are the BEST stuffed mushrooms EVER! I love the crab! We have appetizers on Christmas Eve! I’ll definitely add these to my list, my boys will love them!